Photos by John Reynolds (left), Mary Vasey (top right), and David Norwell (bottom right). Self-heal is a perennial wildflower which grows 10-50 cm tall. The flowers are purplish to pink (occasionally white), 1-2 cm long, and short stalked. They form a dense spike-like cluster at the top of the stem. 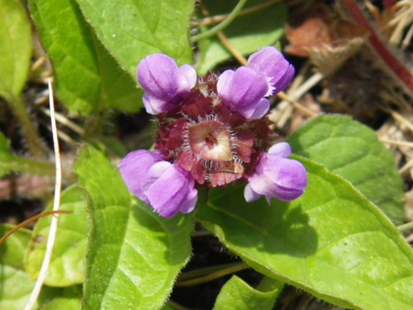 The petals are fused into a 2-lipped tube; the upper tube is hooded while the lower is lobed. The sparse leaves grow in opposite pairs along the step, are lance- to egg-shaped, and have smooth to barely-toothed edges. 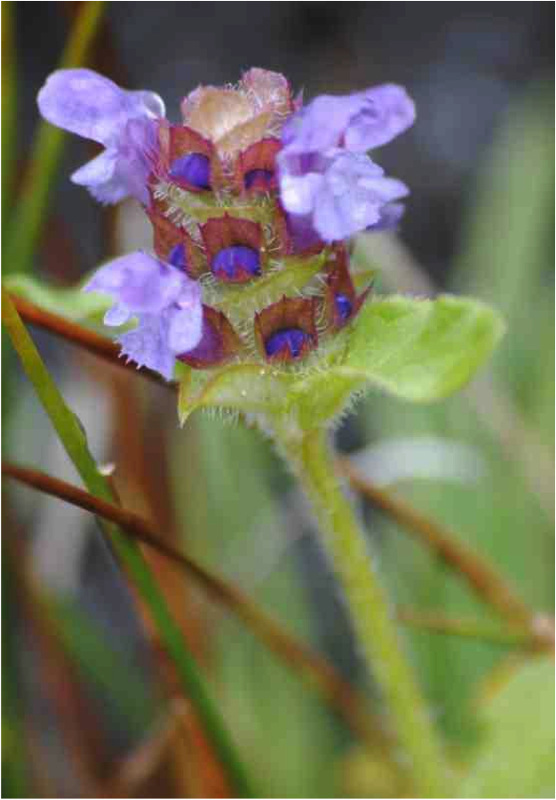 Common at low to middle elevations, self-heal grows well in damp soils including meadows, clearings, lawns, and forest edges. It is a common species throughout most of BC, and is found throughout temperate climates in the rest of North America as well as Eurasia. 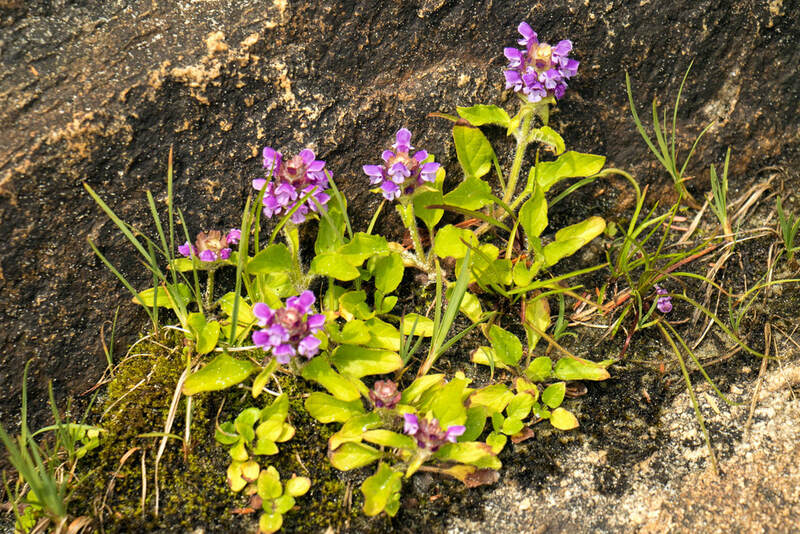 There are two subspecies of Prunella vulgaris: ssp. lanceolata, and ssp. vulgaris. The former is native to North America, while the latter was introduced from Eurasia and has since naturalized in North America. The two can be differentiated by leaf shape and other characteristics. Self-heal has a long history of medicinal use and is known for its anti-viral, anti-bacterial, anti-inflammatory, and anti-allergenic properties. Traditionally the Nuxalk boiled the whole plant for the heart, and the Quinault and Quileute put the juice on boils and wounds. According to the 16th-century herbalist John Gerard, "there is not a better wounde herbe in the world." The whole plant can be applied to a wound to promote healing, and the dried leaves can be made into a tea to treat indigestion and as a general detoxifier. Click here for more details of this plant's medicinal uses. Aside from its medicinal properties this plant is also a tasty addition to salads. Bramley, G. Prunella vulgaris (selfheal). Science and Conservation. Kew Royal Botanical Gardens. Accessed 14/11/2014. Fang X, Chang RC, Yuen WH, Zee SY. (2005). "Immune modulatory effects of Prunella vulgaris L". International Journal of Molecular Medicine. 15 (3): 491–496. DOI: 10.3892/ijmm.15.3.491. Pojar, J and MacKinnon, A. (2005). Plants of Coastal British Columbia, Revised. Vancouver, BC: Lone Pine Publishing. P. 246.